I found this online place where you can have stuff made like your teeshirts etc...but they had something I thought was totally cool...it was called photo-sculptures. You can send a photo and have a standing photo sculpture made out of acrylic, I believe it is. I thought this would be a really fun thing for the ghostie dolls...so I said "sign me up"! So... I now have a "zazzle store" where you can go an purchase a few of my ghosties I've put up for photos sculptures.queenofthefaeries's" Gallery at Zazzle or you can click on the slide show on the side bar. I also decided to add some notecards of "madame know it all and Mysterious Claire from under the stair you can also purchase. I might be adding more images for cards or photo sculptures..so let me know if you have any favorite images you might like to see done! This is just a trial thing for me and a way for you to purchase your favorite image....cheaper than a doll! Hope your Holidays are Jolly.. and everything else ending in Olly! Well..all is fine and Dandy as the ever so Pink, Pretty, and packed up, Miss Pennythistle says Buh- bye to her friends Silke and Liesl, and prepares for her trip back to the U.S. via HedgeHog Express! OOHH NO!! Whats this??!... Ms "P" is still Pink and Pretty....but Poor faithful Mister HedgeHog has turned to stone!! Something dreadful must have happened in the Space/time continuum thingy! My Friend Silke Janas- Schlosser and her assistant Liesl have invited Miss Pennythistle to Germany for christmas and have been sending pictures of Miss "P"'s Christmas adventures while she's there....check out Liesl's diary for more fun photos! Oh Boy!! A Lovely jewel box bed and Miss "P"'s favorite things..Pink ...And.. Shiney!! Have you ever just been so excited you can't sleep!!!..Or... is it that Cat she's keeping one eye open for!! Anyway..I know I'm exhausted and I didn't even go anywhere!!! I hope your all having a Scary merry Christmas!!!! Hugs, Gail, Silke, Liesl...and Miss Pennythistle!! Miss Pennythistle..now an accomplished Stowaway on Santas Sleigh... has made her way to Visit her friend Liesl in Germany! Here are a few photos of her as she arrives on the Christmas Hedgehog..all bundles of snoodles and joy! OHH Merry christmas Liesl! !....And OoHh... Hello Mr Kitty...not expecting you!! To see more of Miss "P"'s Christmas in Germany click on Liesl's diary! MERRY CHRISTMAS TO ALL..(even the cat)! The ever so.. "in the Spirit".. Miss Pennythistle has decided to spread the Christmas cheer and visit her friend Liesl and her troll family in Germany! So she has disguised herself as that famous little reindeer,(looking a bit frozen), Rudolph, and plans on sneeking into Santas sleigh tonight to hitch a ride to Liesls house for Christmas!! Oh Boy..Christmas in Germany! She promises to send photos (asuming Santa doesn't catch our little stowaway, and she safely arrives).... So,... we will be waiting and watching for her Christmas photos on Pins and Pine needles!!! Hope your all having a Happy Holiday!!! Gail and the Theatrical Miss Pennythistle!! So it's a good day to stay warm inside in my jamies..maybe do a little christmas decorating...The Precious and always Pretty in Pink, Miss Pennythistle, decided it would be good to lend a hand...or tiny claw as the case may be...so thoughtful....(Uh huh)!... Plus,.. she has a special attraction for the bright and shiny, and is "collector extrodinaire" for all things Gawdy and tacky and otherwise just pretty to look at! She gets little sparkles in her eyes when she thinks about them! Now,... I will spend the rest of the day trying to untangle her from the tinsels and baubles she just couldn't resist rolling in! Not to mention cleaning up the broken ornaments she tossed up into the tree cuz she was sure they would just "stick" there! Shhhh... I'm hiding the lights!!! In Honor of the Spreader Of Love Award, I would like to share with you some of the really Special gifts I've had the good fortune of recieving lately. And Of course.. the ever so present "Darling of the Stage" Miss Pennythistle, had to make a production out of it!..I would expect no less from her! From the Fabulous Kamila of Wooded Woods came the most precious little Blind girl Iris, and her seeing eye cat!! Who else but Kamila would have thought of such a creative idea for a doll..she is Most Marvoulous in our eyes..Kamila and Iris! Thank you Kamila..she is most precious to me! And of course it wouldn't be complete without the blind leading the blind! Miss Pennythistle has a Monstrous thing for the most zombiefied of all Zombies..none other than Zombie Edgar gifted to me by the Zombie queen herself (you and Kamila might have to fight for that one) Jacqui of Odddollz. He arrived zombified in his own little dark coffin. I think he has a thing for Miss "P" also, but so far he doesn't show much emotion towards her. Miss "P" sprouted her little angel wings and gives Zombie Edgar her tiny teddy so he won't be alone in that coffin....MMNNN.... what could she Really be up to???! Thank you so much Jacqui.. Me and Miss "P" adore him!! From my Italian friend Stef of Gufobardo . came a wonderful spooky suprise package with happy halloween haunting fabric with golden pumpkins and spiders! A SpOoktacular site... and... the most beautiful jeweled earrings!!! Dark and Decatant! ! Miss "P" says they should be hers, as they set off the lovely pale pink pallor of her skin, and look "oh so charming against the deep mossy green pools of her eyes"..(Gag me)! Thank you thank you Stef..you rock! And from my friends Susan and her sweety of a hubby Tuffy, came the most adorable little wooden Spooky doll..One of Miss "P"'s favorites..along with a fabulous inspirational art book Thank you for your kind thoughtfulness! Dark blessings to all of you! Miss Pennythistle has had me locked away in my studio for days untill I finished the dolls I had promised before christmas. She has finally let me out, and now i'm catching up on my blog. I have been given two "Major Awards" by several wonderful people! So I am thanking Sonia of Dark ravens nest. 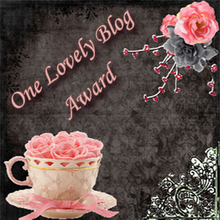 And Chris of Designs by CK for honering me with this "One Lovely Blog Award" award! Thanks Also to Michelle of Studio at Crowhaven Farm . And to Steph of Fantastic Figments for the "Spreader of Love award"!!! Much love to you!! Kiss Kiss! Please forgive me if I've missed anyone! I've tried to go back through the posts and find all the award givers..If I have missed you please let me know and I will add you to the list to thank you!!! Now.... I hope the blog fairy doesn't put the evil eye on me for breaking the rules of the awards, like going to 7 other blogs to give awards..(or in this case 14),..but at the moment I'm so far behind and will never catch up if I do. So I'm making my own rules for now, and, because there are so many "lovely" blogs and so many other wonderful "spreaders of Love" I would like to freely bestow either award, or both, if you like, on anyone who reads this and feels they would love to have these special awards to post on their blog! You may find the rules of the award on any of the other blogs above. Thank you all again for these special awards! Eeny- Meenie, Jelly-Beanie...the Spirits are about to Speak! The Great and Wise Oracle "Madame Knows it All" (aka Miss Pennythistle, aka Miz "P"..Queen "P" Etcetera, Etcetera...)...has consulted her crystal ball...and what did she see, you ask? Why yes..it's true..she's had a vision of a new Ghostie! Ahh how does she do that??
" Madame Knows it all" says she has been in contact with the spirit of "Mysterious Claire"
so very quite, no one even knows that she's there". (Except for you know who)! Mysterious Claire is 12" and her ghostly garb is from antique materials. Her constant companion, Mysterious Miz mouse is always by her side. Mysterious Claire will soon be packing her belongings for a journey over seas to live under a different set of stairs...In the meantime we all wait on the edge of our seats for for "Madame Know it All's" next exciting vision...she's like a Tiny Edgar Cayce all dressed in pink!